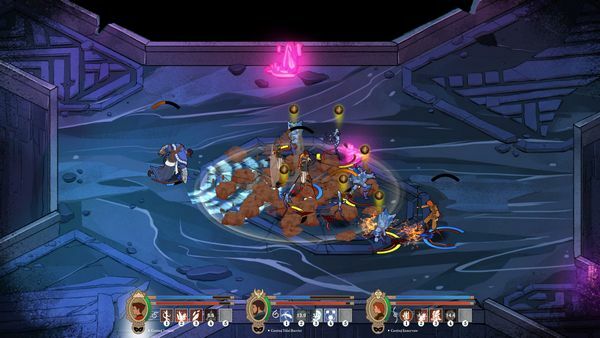 In a world that has been separated into a society of “haves” and the “have-nots”, Masquerada‘s setting of Citte is hard not to see as a statement about the world we live in. Thankfully we have fewer elementally fuelled magical battles though, but even with a brief play at Rezzed recently the numerous inspirations that have fed into the game are clear. 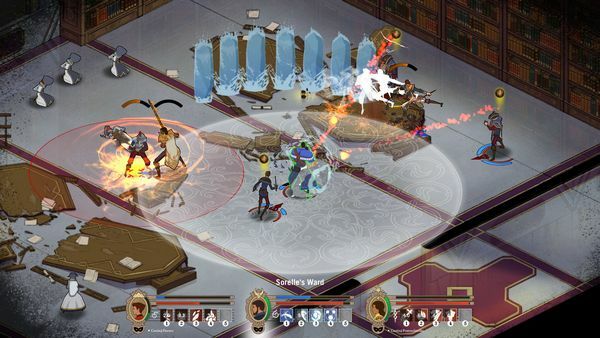 Masquerada: Songs and Shadows – to give it it’s full title – is a forthcoming RPG from Singapore-based Witching Hour Studios, and seems proud of its influences from both the world around us and various forms of media. Seeking to offer an experience following in the footsteps of Baldur’s Gate and Dragon Age, you are cast into Renaissance-era Venice styled environment, complete with intrigue and politics. In the demo on display, you are controlling a team of three as they seek information in a library that has been captured by rebels and attracted more supernatural threats too. Perhaps the first, and most striking point are the visuals, which are described as being influenced by French comics and definitely have elegant designs and strong colours. This also well suits the team, who are all in uniforms with colours that suggest the elements they channel in combat – these magical powers drawn from masks that the more successful members of society get to use, and in turn maintain advantage over those without them. The sound also fits, with music being composed of strings and horns, and all dialogue experienced being voice acted. The characters themselves all speak with the social politeness of those who respect positions of authority, even if they have less respect for the person currently in one of those positions; in the demo, conversation between two team members suggested friction between their beliefs, ever well spoken even when using pointed language. That said, there were no options for replies and it remains to be seen if this will lead to alternate situations in the main game or if it is just follows the story we’re being told. Combat is largely real-time, but allows you to pause at any time and give orders… and at this point things began to feel chaotic. The problem with playing at shows is you rarely get to see what options you have, because I was quickly wondering if the allied AI could be brought under more control. Each of the three members of your team have sets of powers, all of which work on an individual timer, and when not using skills they will instead engage targets in regular combat. Pausing combat to make best use of these timers is essential, as is making sure that you can move characters around the brawls to where their abilities can have the most effect. However, whichever characters you are not actively controlling at any time are instead being left to do their thing by the game, firing off skills and chasing down enemies to hit. On paper this sounds very helpful in confusing situations, but in practice left to their own devices my team would often scatter after enemies as they spread out, using skills when the timers were ready but not always when they’d help most. Instead, to take on the two larger demo fights I found I was pausing every second or two to switch character, use whichever skill was coming up next and to keep them focused on targets… there was a sense of herding cats. Energetic cats, in the midst of a flock of birds. And to be clear, this was a show demo of a game still in development, so it’s hard to say how much this might still be reflected on release – or if there may be options to stop the AI using certain skills so they’re left for the player, or other options to maintain better control. I genuinely hope so, because the setting and atmosphere of the game are striking, and even with concerns about how the team handled larger combat situations, when facing smaller – and focused – fights it felt significantly more like my choices as a player were making a difference, instead of simply keeping the AI from beating itself. 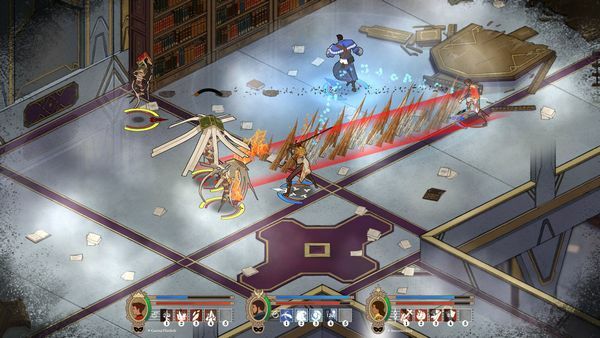 Masquerada: Songs and Shadows is due for release in the summer this year on PC, Mac, Xbox One and PlayStation 4.